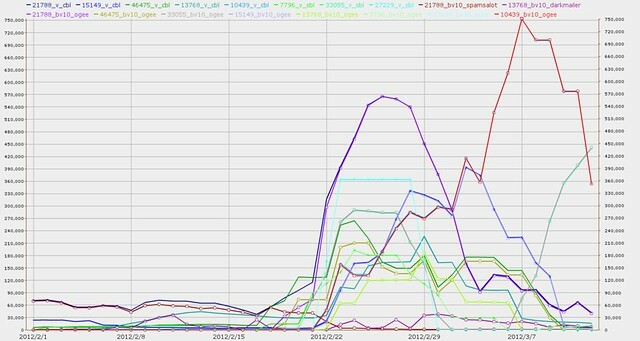 Perilocity: Did the February 2012 spam surge come from one botnet? 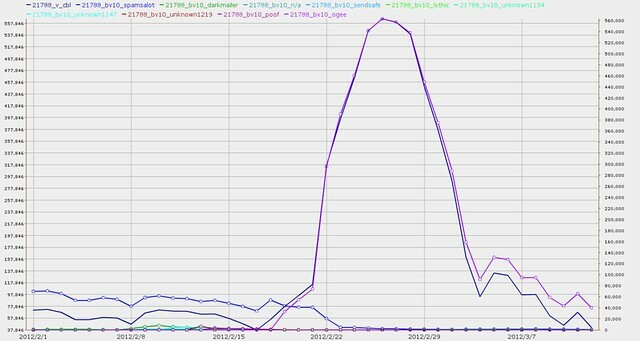 You can see the very close correlation of the smooth curve for overall spam from AS 21788 (left axis) with the dotted curve for spam from Ogee (right axis). AS 10439 CARINET was one of the least affected initially, but its infection by Ogee kept growing into March. It finally peaked on 7 March. 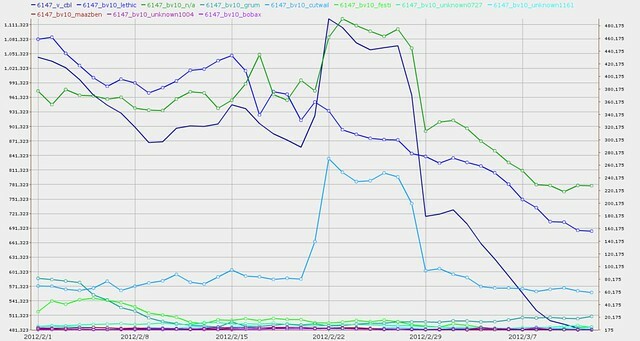 That darkmailer problem recurred at the end of February. 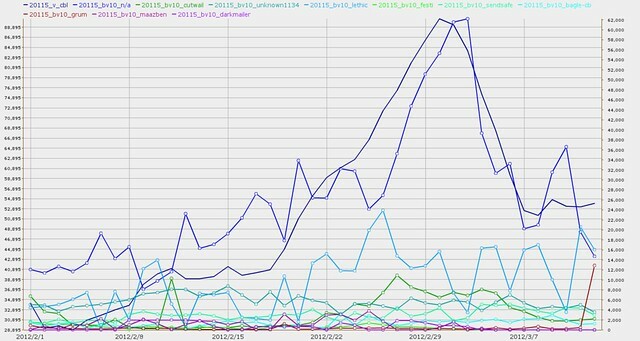 Even Charter's AS 20115 got a belated spam surge towards the end of February, although CBL tagged the spamming addresses as n/a, so we don't know which botnet (if any) was causing it. 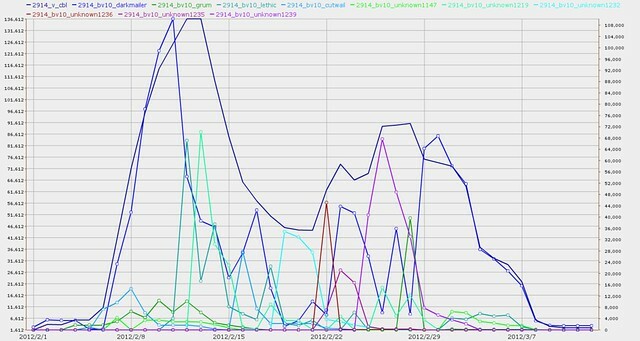 AS 6147 turns out to be indeterminate, since the biggest spam burst source was labelled n/a by CBL, which means CBL determined those messages were spam without having to dig deep enough to label the source by botnet. 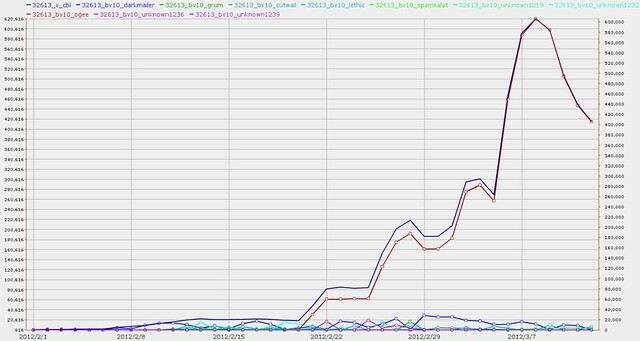 However, the second biggest burst, and one whose curve tracks the overall spam from AS 6147 very closely, is from cutwail. Yes, that one correlates with Ogee, too. And it only got worse in March, finally peaking on 8 March 2012, a day after the similar surge peaked for AS 10439 CARINET. 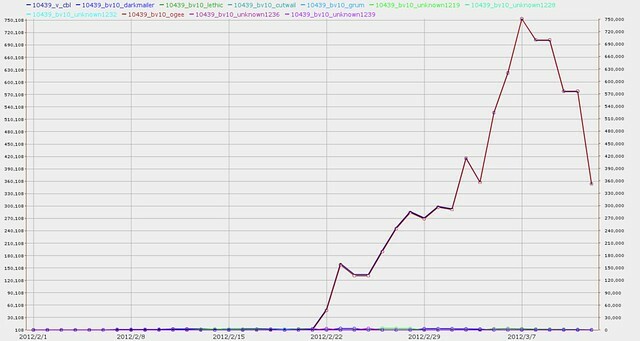 So according to botnet labelling by CBL, 9 ASNs that showed spam surges in the U.S. and Canadian top 10 SpamRankings.net for February 2012 were infested by the botnet Ogee and that spam came from that botnet. Next: what other ASNs were affected by Ogee in the same time period?